Fifteen Portland swimmers who attended the Falcon Sprint gala in Hucknall on 9th Sept 2018 were disproportionately represented in finals and indeed in the list of overall winners. For a small club, we produced a lot of finalists. Judd, Isla, Erin, Bea and Edward each got personal bests in three events. 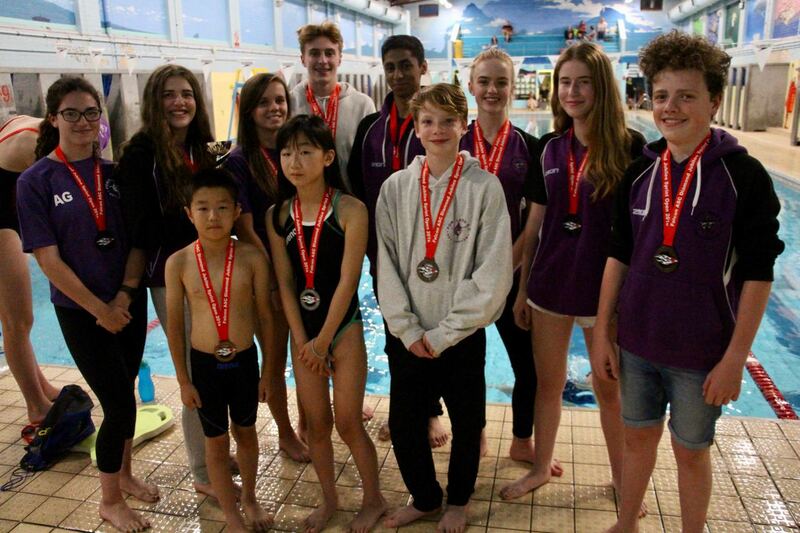 Adam, Lucian, Taka, Gaby, Angelina, Saki, Saachi, Raj and Freya also got personal bests in multiple events. Issy B. was within a fraction of a second off two PBs. In the girls 15 and over final for 50m Fly, Bea, Gaby and Erin made up half of the finalists, winning 1st and 2nd. Edward swam 50m breast stroke in 33.95, just 0.25 seconds off the Midland qualifying time men. Thanks are due Cathy for organising the entries, to Matt the coach and to all the parents who helped. And we are grateful to Falcon Swimming Club for a happy and successful day. Judging by the laughter at training sessions, the children are enjoying their training, so its nice to see that Matt’s rigorous regime is paying off for them.